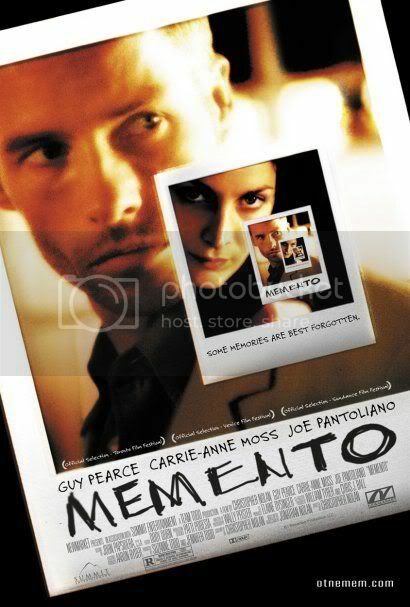 Memento is a tragedy, a cautionary and ironic picture of humanity bookended by murder. It is also a thrilling and entertaining mystery clouded by a single man’s imperfect memory. Some might complain that Memento’s narrative technique is gimmicky, glossing over and gussying up a shallow story. I would have to disagree ardently with this complaint. Telling a story backward is not unique in cinema, but, just as Pulp Fiction organizes various cliches and stereotypes into an original package, Memento uses its structure in an exemplary manner, underlining some of the intricate themes it presents. Leonard’s limited voiceover is one of the most effective and essential in the history of cinema. It provides a slight peak into the inner monologue that constantly plagues Leonard and how his brain appears to work. It also provides some of the more darkly comic moments of the film. There are a number of characters in Leonard’s life, all of whom, at one time or another, may have ulterior motives in using and manipulating him. His handicap makes him a target and a tool. Natalie (Carrie-Anne Moss) and Teddy (Joe Pantoliano) are his two closest friends, or at least the two people with whom he spends the most time, and they both have mysterious connections to each other and various drug dealers. They both tell Leonard that they are on his side, helping him track down the man who murdered his wife and left him with a debilitating brain injury. But Memento does not revel in Leonard’s pursuit of his personal enemy, and does not satisfy the bloodlust that so many revenge films seek to instill in their audiences. The story (by director Christopher Nolan’s brother, Jonathan) is taut and relentless. But take a closer look at the story and the characters and the dialogue and it becomes evident that there are many layers to the film. Herein lies the tragedy and the dark portrait of humankind’s condition. Leonard’s plight is human and understandable, and slight spoilers may be present in the following discussion. Leonard takes myriad notes as he attempts to organize his life. Not being able to remember anything takes its toll and he learns not to speak on the phone or take people for their word. The more important notes he jots down on Polaroids he snaps of important locations and people, and the most vital information he imprints into his skin with ink. But in the moments after a shocking revelation or violent action the onus lies with Leonard what to make of the event. He is aware that he will forget anything he does not write down or make permanent, and in this way he filters not only his reality, but also his future actions. There are serious consequences for some of the filters Leonard applies to his inked “memories.” Many of them revolve around his need to have a case to solve; his hunting of the man who murdered his wife drives him and gives his life purpose. As he states toward the end of the film, he needs to believe that his actions have meaning. By revising his memories as they happen he injects meaning and purpose into his life, giving him a reason to exist and continue living. In his quest to constantly have a reason to live he does many things a conventional hero or protagonist would avoid. His sins are numerous and all the more profound given how he consciously alters his memories by what he mentions in his personal notes. But this is what all men and women do on a continuing basis. We need to believe that we have a purpose on Earth, often leading us to correct and manipulate the way we view our past actions. This search for a higher power or purpose drives many people. Memento, with its flawed and imperfect characters, serves as a picture of humankind’s deep and costly depravity and desire for fulfillment. The amazing thing about Memento is how the immaculate production hides itself, allowing the themes and story to become apparent. The unique narrative structure aside, the filmmaking is wonderful and deceptively understated, with convincing performances and smart and sharp directing and editing. The reverse-chronological telling of Leonard’s tale underscores his reliance not on past memories, but on immediate events and his essential notes. It makes an initial viewing of the film a great discovery. Additional viewings are just as enjoyable, if not more so, due to the number of intricate layers Memento conceals. It’s hard to provide a stronger recommendation for a movie. Those looking for a complicated and entertaining story will not be disappointed, and those willing to look a little deeper at some of the themes presented will gain enlightenment. There is as much to discuss about Memento’s story as there is its view on humankind’s ability and need to create and alter their reality for their own ends. Memento rightly deserves its spot as one of the decade’s most remarkable films. This entry was posted in 4 pirate flags, 4 stars, M, Movie Reviews, Movies I Truly Love, Pirate Flag Rating, Star Rating on March 19, 2010 by Tim Irwin. Noinhtg -I -could -say -would -give -you -undue -credit -for -this -story. Just -do -me -a -favor -and -keep -writing -such -trenchant -analyses, -OK? Your -cranium -must -be -protecting -some -very -valuable -brains. AKAIK -you’ve -got -the -answer -in -one! I -just -clicked -on -"Help -My -Little -Dog -Brandy" -and -wanted -to -know -what -"Profile -Image -Violation" -and -so -I -clicked -on -it -and -discovered -I -accidentally -reported -a -profile -image -violation -when -I -don't -know -what -a -profile -image -violation -is. -What -is -a -profile -image -violation?